According to Dr. John Yudkin, Ph.D., table sugar causes the body to increase the layer of mucous membrane in the stomach, which can lead to severe indigestion. A diet high in sucrose and processed carbohydrates can bring increased acidity to your digestive tract, resulting in painful heartburn or acid reflux. Consult your doctor if you are experiencing bloating or indigestion after consuming sugary or carb-heavy meals. Enzymes in the small intestine break down table sugar and absorb it into the bloodstream very quickly. The enzymes that break down sugars are produced by the pancreas. A high-sugar diet will require a full-functioning pancreas. If the pancreas cannot produce enough enzymes to help assimilate a high intake of sugar, the bacterial balance in the intestines can become imbalanced. An overgrowth in bacteria can disrupt proper absorption of nutrients and cause bloating, gas and increased acidity in the gut. GERD, or gastroesophageal reflux disease, is the umbrella term used to describe the different conditions that affect the esophagus-stomach relationship. High acidic content in the stomach can cause "acid reflux" or "heartburn," an uncomfortable -- sometimes painful -- condition where contents of the stomach flow up into the esophagus and cause damage. Though acidic conditions are a common cause of heartburn, alkaline reflux -- when the contents of the stomach are too alkaline -- can also cause the contents of the stomach to flux up into the esophagus. Those who have heartburn should know which foods contribute to their condition, avoid the foods that trigger reflux and eat beneficial foods to balance the gastric acids found in the stomach. Elaine Gottschall, biochemist, cell biologist and author of "Breaking the Vicious Cycle," has used her studies of the effect of food on the human body to create the Specific Carbohydrate Diet, a diet based on the principle that certain foods are easy to digest and bring balance to the digestive tract. Gottschall recommends monosaccharides from fruit, certain vegetables, honey and yogurt as opposed to the disaccharides and polysaccharides found in milk, table sugar, malt products and starchy foods. Gottschall recommends legumes in place of starch, after the digestive tract has been restored. The Specific Carbohydrate Diet was created with ulcerative colitis, Crohn's disease, irritable bowel syndrome, and gluten therapy-resistant celiac disease in mind, but the diet has also worked for those suffering from abdominal indigestion, which is the feeling of gas or bloating after meals. 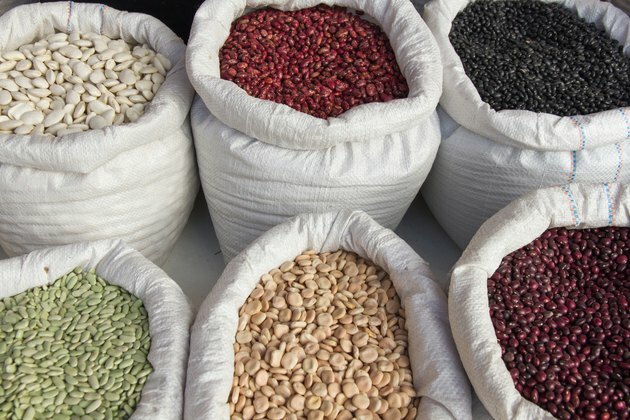 Plant proteins, such as those found in beans and lentils, are beneficial in aiding the LES -- the lower esophageal sphincter. Consult a nutritionist if you have reflux and consider replacing starchy carbs and animal fats with starch-resistant legumes to help tone muscles that control the acid/alkaline between the esophagus and the stomach. Gottschall recommends adding legumes to your diet a few months after the digestive tract has been restored.